The 1940's were a difficult time for all plantations--more so for Hakalau. World War II resulted in shortages of manpower, supplies and equipment. Neither manpower nor supplies were available to address housing needs with the result that only 2% of camp dwellings were built during this period (tabulated from the insurance valuation files from the early to mid-1950s). Everyone--remaining adult male employees, students and women--rallied to fill in gaps. With the shortage of manpower, greater priority was given to adopting mechanical means of harvesting, a challenging proposition due to the steep and uneven terrain and muddy conditions. Nevertheless, mechanical harvesting grew from 8% of total crop harvested in 1944 to 31% in 1949. 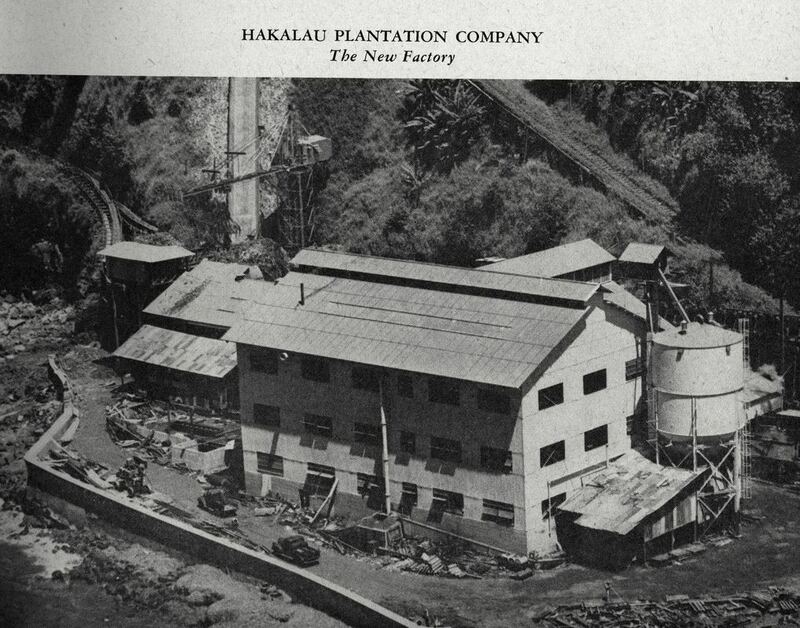 The Waile‘a Milling company merged with the Hakalau Sugar Plantation in 1943. The all-time maximum production reached at 26,509 tons for the year in 1944. By this time, 40% of the cane was grown by over 300 independent or contract planters on individually or company-owned small plots...a complex scenario to manage. 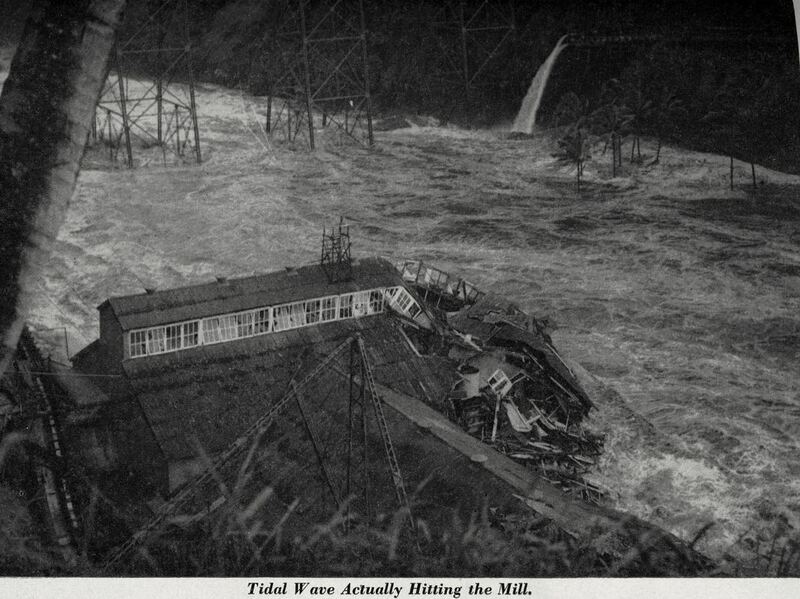 The April 1st 1946 Tsunami (referred to as a tidal wave in the annual reports) was disastrous for Hakalau, destroying the Hakalau Mill and some railroad bridges, leading to the demise of the railroad. Massive destruction at the mill site effectively shut down production for one year. 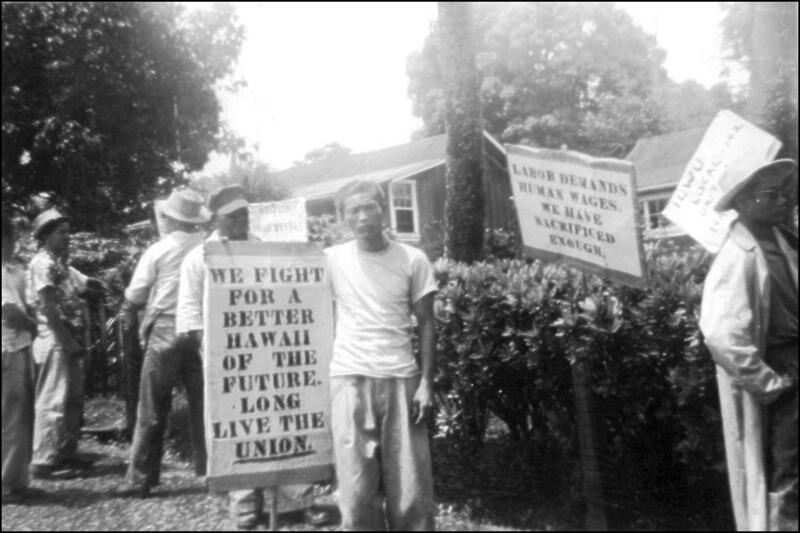 Postwar labor strife compounded the problems faced by the plantation and set the tone for the following decade. 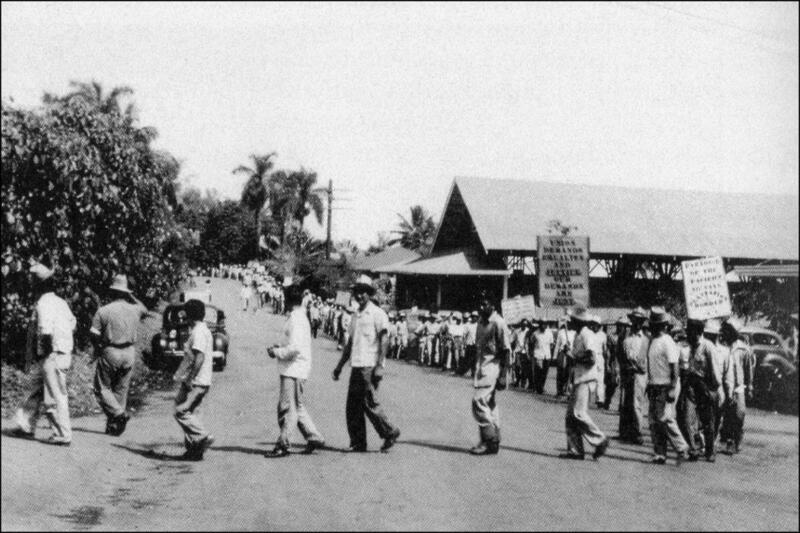 The first industry-wide strike disrupted all operations at the Hakalau Plantation from September 1-November 19, 1946. Included in this detailed timeline of the 1940's are excerpts from the annual reports sent to C. Brewer by John M. Ross, Manager, Hakalau Plantation Company until mid-1942, W.C. Jennings, Manager from 1942 until April 1948 and Martin J. Black, Manager from 1948 until 1950. Annual reports provided courtesy of the Edmund Olson Trust Archive. ​While our housing program is still being held in abeyance pending a brighter outlook for sugar, be assured that all houses are kept in good maintenance and repair…. Finger printing of resident aliens was started in Hakalau. ​These had the usual yearly repairs with the addition of rooms or kitchens, as the case might be, where required. Front page article in The Honolulu Advertiser recounts the 65 year history of the Hakalau Plantation. This article is notable because John M. Ross, manager of the Hakalau Plantation from 1905-1942, and employee of the plantation since 1895, was available to share the history. Anxiety about the potential for war was increasing and plans were made regarding local food production. War conditions have, of course, affected plantation operations. You will note from the Manager’s Report for 1941 that the plantation was short-handed during that year and this condition naturally did not improve during 1942. A fine response from department heads and from employees almost without exception has made it possible to harvest the crops for the year and to take care of growing crops. Mr. John M. Ross retired as Manager of your plantation on July 31 after completing 37 years as Manager and having served your company for a total of 47 years. I take this opportunity to record the excellent physical condition of your property and the fine loyalty of the plantation personnel which developed under his stewardship. I also commend and express my appreciation of the fine spirit of cooperation and helpfulness shown by department heads and all employees since I took over the management of your company on August 1. Our affairs are so complicated by the war that now, more than ever, we are indebted to your Agents, C. Brewer and Company, Limited, for their various services to the Plantation. In addition to their aid in the many new problems which have arisen as a result of the war, we call attention to their services to us in the matter of priorities and shipping permits in connection with the procurement of materials and supplies…. The above tells the story of fewer men working together well during the year 1943. Not only have these men maintained sugar production but they have carried on their full share of civilian defense activities. A total of $197,975.00 War Bonds has been purchased by the plantation population since the beginning of the war. The Hakalau Company of Hawaii Rifles has been maintained at a strength of 154 men. These men have on their own time and in addition to their regular employment on the plantation, faithfully carried out the training program set up by the military authorities. This organization is recognized by the military authorities as a valuable adjunct of the defenses of the Island. ​In this sixty-second annual report and the third of World War II we have to record an eventful year in the history of your company. The purchase and transfer of all assets of the Wailea Milling Company, Limited, was effected during the year. Hakalau gains through increased tonnages and simplified field operations. We can say that mechanical harvesting has passed the experimental stage even though the equipment in use is not well suited to conditions of heavy rainfall, and therefore frequently wet and muddy soil and uneven terrain. During 1944 but 8 percent of the cane tonnage was mechanically harvested. No greater use of this equipment is planned during 1945 than is absolutely necessary to insure harvest of the crop…. The Student Victory Corps continues to perform valuable work in the fields. Approximately 66 of the older boys work in harvesting and some 90 of the younger boys and all the girls work in weeding and planting operations. We estimate that 6 percent, or some 1500 tons of sugar was harvested by student workers during 1944. Our planting program is almost entirely dependent on the work of these youngsters. Members of the Hakalau Company of the Hawaii Rifles have diligently and faithfully carried on with the training program prescribed by the military authorities. The important part ascribed to the Hawaii Rifles in the defenses of Hawaii has lately been reaffirmed by a representative of the Commanding General. Paying tribute to the management of August S. Costa for keeping alive a venture that he described as uneconomical from the outset, Willis C. Jennings, manager of the Hakalau Plantation Co., said late Saturday that when Hakalau takes over the assets of the Wailea Milling Co., all Wailea employees will be absorbed into the Hakalau organization. Wailea cane will be ground at the Hakalau mill, he added. In a formal statement, following one issued by Mr. Costa disclosing that the Wailea stockholders will meet March 21 to conclude sale of the Wailea to Hakalau, Mr. Jennings said, “[A] happy situation has developed which promises to benefit all parties involved in the deal. The stockholders of the Wailea Milling Co. will get a return which will more than cover their original investment. The number of unskilled adult male employees dropped from 684 as of December 31, 1944, to 660 as of December 31, 1945. This is a decrease of 24 workers during the year. The Student Work Program, which was discontinued at the year’s end, furnished us with valuable assistance in planning and weeding operations. Some of the older boys worked in the harvesting fields. We will miss this help from the school children during 1946. Although we start 1946 operations with a reduced labor force we are hopeful that the Filipino Importation Program as approved by Governor Stainback will partially correct the serious labor deficiency. The local unit of the Hawaii Rifles was inactivated during 1945. Too much credit cannot be given to the members of the Hakalau Company for the manner in which on their own time they faithfully carried on the prescribed training program. Many of the members carried on with other community and public duties as well as Hawaii Rifle activities. On September 28th a contract was signed with ILWU Local 142 Unit 5 as bargaining agent for certain of our employees. We can report that the officers of the local unit have assumed their duties with an attitude of reasonableness and cooperation which promises for industrial harmony during the life of the current contract. We are hopeful that the entire Union membership will become aware of thei obligations and responsibilities under the contract. The decrease in the number of workers available as cane cutters has forced us more and more into mechanical harvesting. As reported elsewhere, we can supplement the supply of hand cut and hand flumed cane by this method. Mechanical harvesting as now practiced is only a makeshift or stop-gap operation, however. Serious drawbacks are: Mechanically harvested cane lowers the grinding rate and interferes with operations at several stations in the factory; equipment now in use compacts and puddles the soil, removes large quantities of irreplaceable top soil and reduces the stand of can in succeeding ratoon crops. Work is being done on this problem and we are hopeful of the development of satisfactory equipment but none is in sight at present. More information about life on the Hakalau Plantation in 1945 is presented in the Voice of Hakalau, the plantation's newspaper. For 1945, there is only 1 issue available: November. This sixty-fourth annual report of the Manager records one of the most disastrous years in the history of your company. 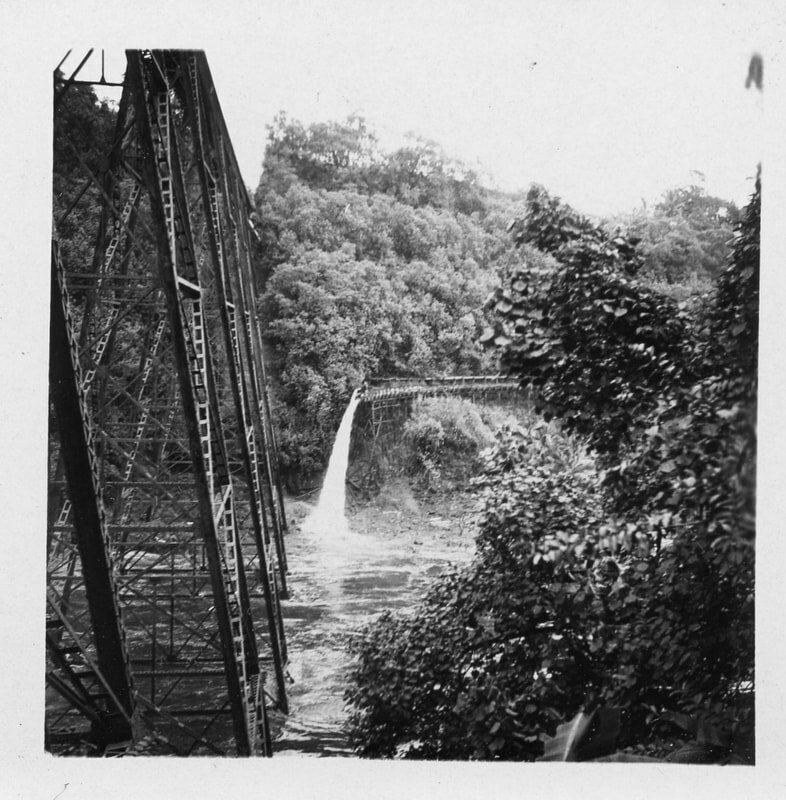 The tidal wave of April 1 almost completely destroyed the boiling house and machine shop and damaged the crushing plant, boilers settings and furnaces, feeder table, and flume approaches to the cane carrier and carried away the storage flume and trestle across Hakalau Gulch. The cost of reconstructing the factory plus operating losses over the period during which no sugar was produces will total well over one million dollars. On August 31, 1946, the agreement with the International Longshoremen’s and Warehousemen’s Union expired. An increase in the price of sugar was in prospect but at that time the industry could not determine the probable amount of the increase. The Sugar Industry Negotiating Committee offered wage increases which were refused by the union. On September 1 a most unnecessary strike was called which resulted in a loss of wages to our workers which they will be unable to recover or to make up. When it became apparent to the industry that the increase in the price of sugar would prove a substantial one, further wage increases were offered the union. The strike terminated on November 19. 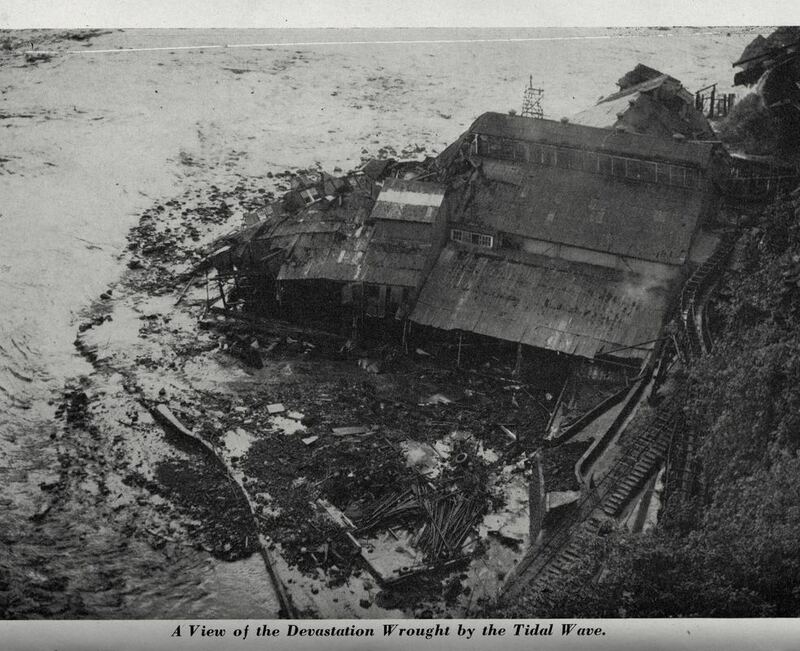 The tidal wave completely demolished the boiling house and machine shop. Considerable damage was done to other parts of the factory. The Directors very promptly authorized the factory restoration program which included the improvements previously authorized but not yet installed. Much difficulty has been had in getting delivery of materials and machinery. The original estimate called for completion of the project in November, 1946. Under more nearly normal conditions this could have been done. At this writing we are still waiting delivery on certain vital pieces of equipment. Material shortages, strikes in the plants of mainland suppliers of equipment, shipping tie ups and then the local strike have resulted in a delay of many months over the scheduled date of completion. As a result of tidal wave damage replacement coupled with improvements previously contemplated or authorized the factory is being practically rebuilt. The few undamaged stations in the factory have been taken down and rebuilt. All piping and wiring throughout the factory have been replaced. The new factory will have increased capacity and should give higher recovery. The strike lasting from September 1 to November 19 naturally placed industrial relations under considerable strain. We are pleased to be able to report that relations with employees are approaching normal and that men-day performance is good. We were allocated 71 new men under the H.S.P.A. Filipino Importation Program. These men proved to be a high type of Filipino worker and will of course augment our force of harvesters. ...a movie made by my grandfather Ralph Murray who was the bookkeeper at the plantation. He and his wife Lila lived in house number 113 in the upper camp for managers, next to the plantation managers home. The young boy is my uncle Fay Murray. 1946 Tsunami photos taken by Shigeharu Furusho. The first two were included in the 1946 annual report. The third was in the Waichi Ouye collection, courtesy of his family. 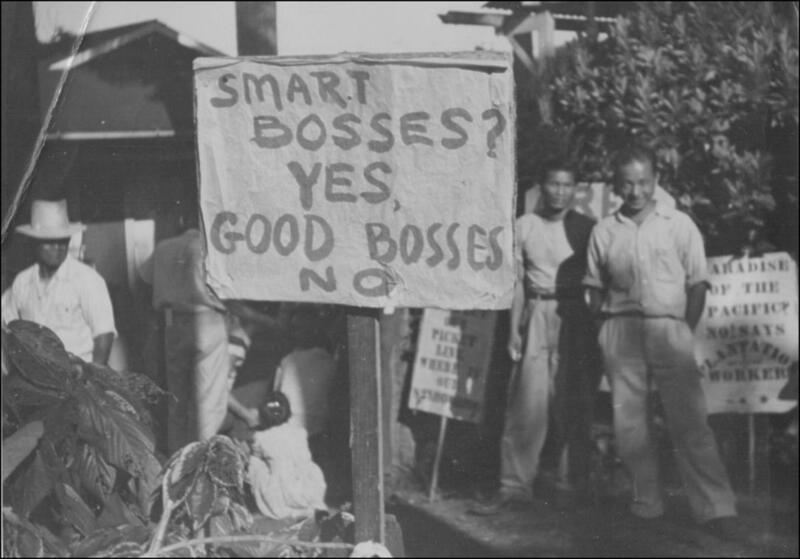 Before 1946, in Hawaii, the "Big Five," a sugar oligarchy with five companies, controlled the prices of goods and services, politics, social structure, and employment. The 1946 sugar strike challenged this social structure. Laborers realized all ethnicities must collaborate in an organized effort. Thus, labor leaders, mostly from the International Longshore and Warehouse Union, coordinated this collaboration, which protested low pay, poor working conditions, and racial segregation. For 79 days, 21,100 laborers struck at 33 out of the 34 largest plantations, shutting down the sugar industry. Because the sugar cane dried up on Oahu, the Big Five sugar companies lost about $15 million. The employers had to concede to the laborers' demands, and the laborers went from the lowest to the highest-paid agricultural laborers in the United States. This victory allowed the laborers to finally exert leverage in negotiation compensation and paved the way for other laborers to strike. 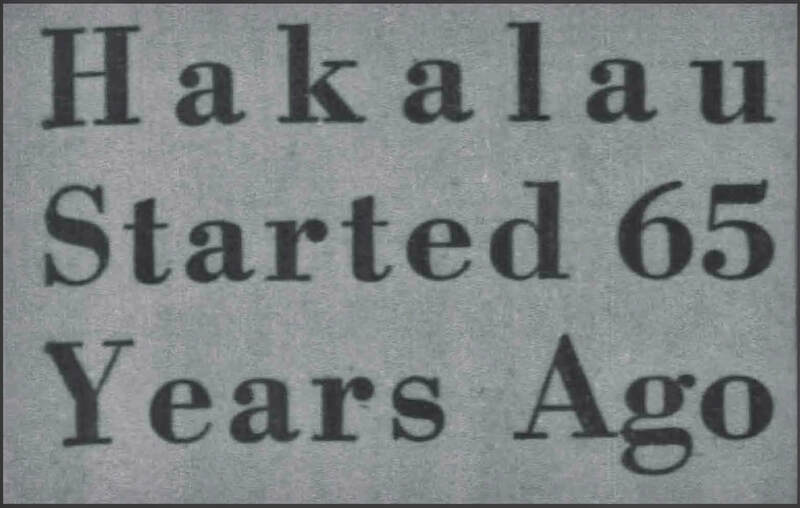 More information about life on the Hakalau Plantation in 1946 is presented in the Voice of Hakalau, the plantation's newspaper. For 1946, there is only 1 issue available: January. This sixty-fifth annual report of the Manager of your company is a continuation of the story of the preceding year and records the struggle to make recovery from the effects of the tidal wave damage of April 1st, 1946. We started the year 1947 with high hope for quick recovery. Disappointment came with the inability to get the factory in operation within the expected time. Time and time again the date of completion had to be moved back following inability to get machinery and equipment on promised delivery dates. Certain vitally needed equipment was not delivered until March 1st. The factory went into operation on March 7th in an incomplete condition. In some cases temporary or makeshift equipment was in use which had to be removed and replaced later over weekends. Boiling House control instruments were installed as the equipment became available over a period of several months. Faulty equipment caused many delays over the first few months of operation. Further disappointment came with the drop in the quality of cane near the middle of the year. Early in the year it appeared that the over-age cane, which had accumulated as a result of the factory being out of operation for almost a year, was in good condition. There was no indication of excessive deterioration of cane until after June 30th. Weather conditions during July and August changed the picture. During these months the rainfall, while not heavy, was evenly distributed with heavy overcast. The result was that deterioration set in very rapidly in all over-age cane. The gradual increase in factory efficiency during the year was offset by the pooer quality of cane with the result that there was no increase in the rate of sugar production over the latter part of the year...This poor quality of cane upset all production and financial estimates for the year. Early in the year it became apparent industrial relations were improving from the strain of the strike and troubled industrial relations of the preceding year. Employees are aware of the difficult financial situation in which your company has been placed by the tidal wave damage to the factory and the consequent loss of production over a long period. They have been informed that as of December 31st, our indebtedness in the form of ban and other loans totaled $1,260,000 and they recognize the necessity which we face of increasing production and lowering costs. More information about life on the Hakalau Plantation in 1947 is presented in the Voice of Hakalau, the plantation's newspaper. For 1947, there are 5 issues available: June, July, August, September and October. ​Manager W.C. Jennings resigned April 1, 1948 and was replaced by Martin J. Black. The properties in general are in fair condition. Our two greatest needs are new homes for employees and field roads. The camp houses and roads are in very bad condition. With the addition of two new Kenworth 532 Cane Hauling Trucks and one new Northwest 25 Cane Loader, early in 1948, our mechanical harvesting equipment is in pretty good condition. The plowing and cultivating equipment should carry us through the year 1949 without too much trouble. …The Hakalau Hospital was closed on December 31, 1948 and our hospital facilities were merged with those of Pepeekeo Hospital which serves, in addition to Hakalau, Pepeekeo and Onomea Sugar Companies. All patients are treated there and a bus transports them to and from the hospital daily. ...A new agreement was entered into between the I.L.W.U. Local 142, Unit 8, and your Company on September 1st, which will remain in effect until August 31, 1950. Provision is made in the contract for wage reopenings on April 30, 1949 and December 31, 1949. Our dealings with all labor and the Union have been on good terms and the morale is good. Of the total tons of net cane harvested, 31 per cent was harvested mechanically and 69 per cent was hand cut and flumed. We are still suffering from the effects of the Tidal Wave of April 1946 and the prolonged strike of three months during the later part of the same year. That year due to the above, it was only possible to harvest 1,762 acres. This resulted in overage cane and it was necessary to harvest 4,173.4 acres in 1948 to get this cane to the mill. When this was done our crops ran completely out of schedule and the result was the small crop for 1949 and the estimated small crop for 1950. The 3,925.6 acres which we plan to harvest in 1950 is approximately half the area under cultivation and will bring us back to a normal cropping schedule. In this manner we hope to get closer by 1951 to a normal age of cane for Hakalau. General Condition of Properties: Our field roads and camp houses are still the two biggest problems at Hakalau. All the other properties are in fair condition. Health and Labor: As in the past, all employees and their families were well cared for during the year. The same medical plan was in effect which gave members complete medical and surgical care. ...A new agreement was entered into between the ILWU Local 142 Unit 8, and your Company on December 6, 1949, which will remain in effect until August 31, 1951. Our dealings with all labor and the Union have been on good terms and the morale is good.